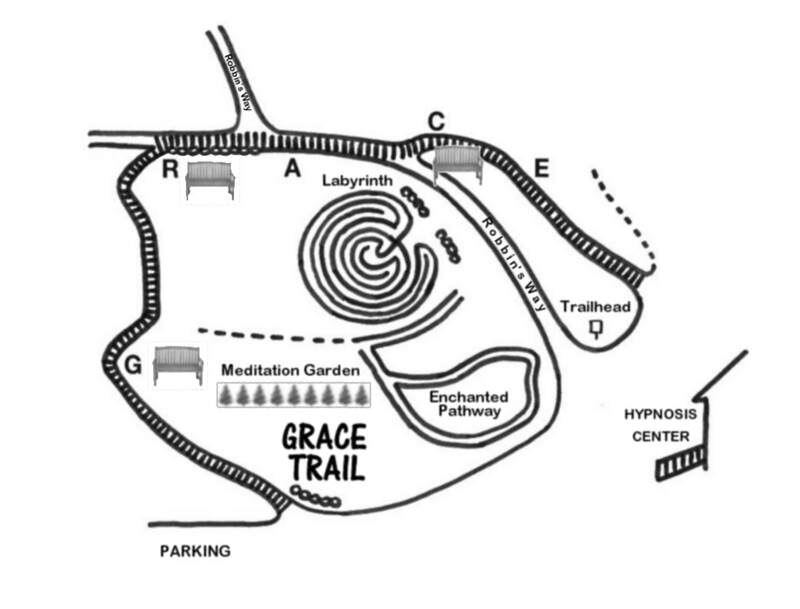 YOU ARE INVITED TO HIKE OUR TRAILS AND WALK THE LABYRINTH. 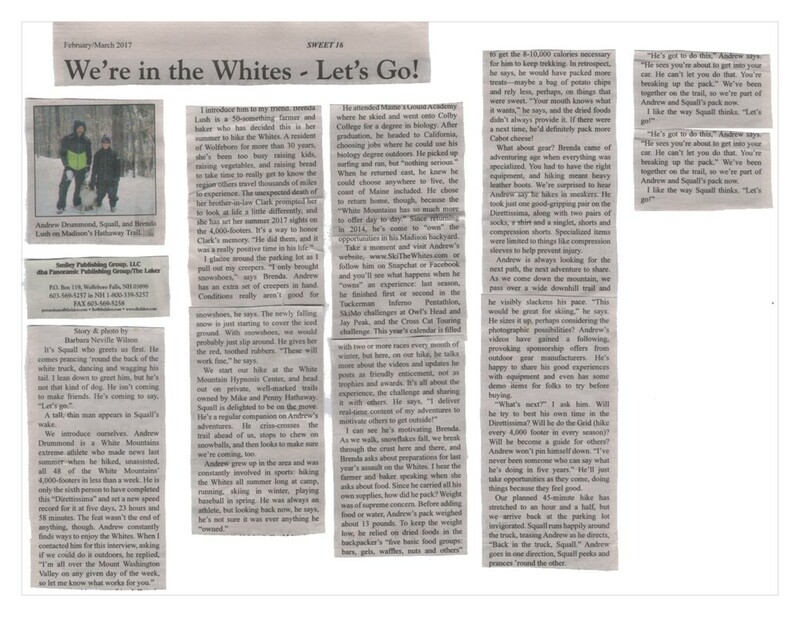 The White Mountain Hypnosis Center has almost three miles of trails that are open to the public during daylight hours, and in the winter are available for snow-shoeing (or cross-country skiing for the more adventurous - some are pretty steep). The easiest route is to start at the top at Kyle's Trail and work your way down to the Center. Kyle's trail leaves from a log landing off a Madison NH Class VI Town Road (Albert Road), one half mile up Colby Hill Road on the right. 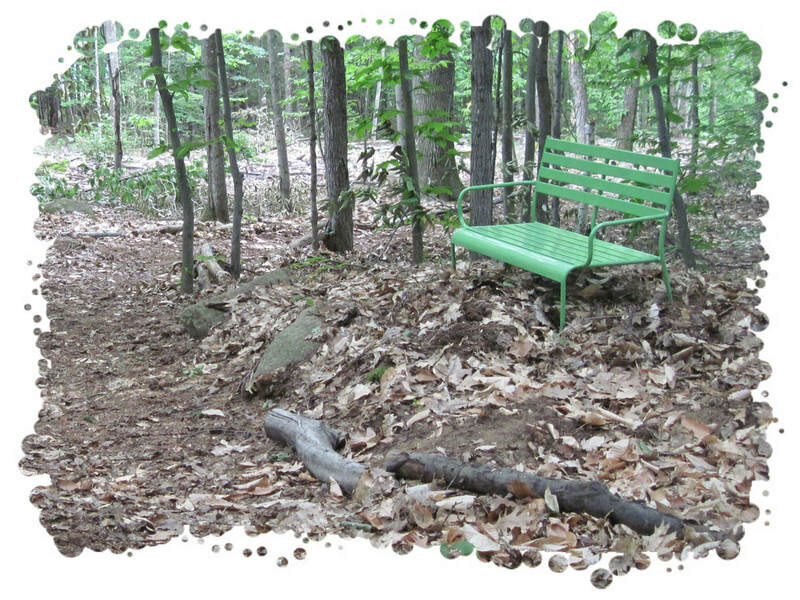 The trail is named in honor of Kyle Koch, who built it with a team of Boy Scouts while working on his Eagle project. The trail works its way to breath-taking views of Mount Chocorua, Mount Washington, the Moats, and the mountains of central New Hampshire. Along the way one can stop at Stone Cutter's Rest, a nice picnic area left behind from granite quarrying of 100 years ago. If you want a better workout, you may decide to park at the hypnosis center and take Robbin's Way up to the "view". If you follow the entire Robbin's Way, you will end up at the parking lot by Kyle's Trail. At the intersection of Kyle's Trail and Robbin's Way ("the view") we encourage you to head southeast on the Ledge Trail. At the end of that trail you will find views overlooking the Town of Madison, particularly in winter. There is a picnic table waiting for you. 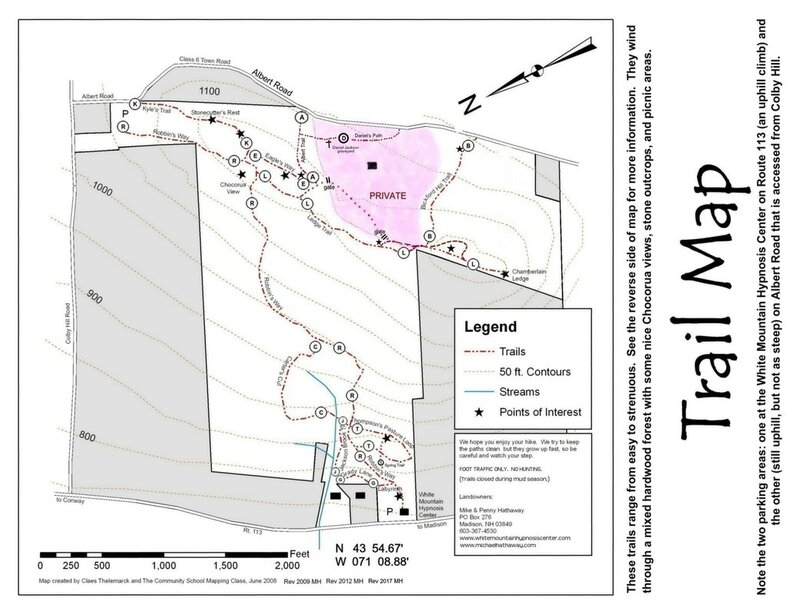 Maps are located at Kyle's Trail and the beginning of Robbin's Way. THE LABYRINTH IS AN ANCIENT TOOL for worship, problem solving and healing. Early civilizations all over the world used these forms on the earth, in temples and cathedrals, n pottery and architectural façades. Many old labyrinths remain, and new ones are being created. WMHC associate Martha Douglass has determined by dowsing, as communicated through the Universe, a peaceful and contemplative area behind the White Mountain Hypnosis Center, and created a labyrinth. It is open to the public during daylight hours from May to October. Here one may bring a question, a worry, a problem, or just take a reflective walk through the seven connected circles that look from above like the two spheres of the human brain.